The Chora Museum, also known as Kariye Müzesi, is an oddball site in Istanbul. It pre-dates Islam, but is located in one of the city’s most conservative Muslim neighborhoods, in an area known for its historic wooden homes and nearby city walls built by the Romans and Byzantines. This museum doesn’t make the cut for visitors trying to hit the greatest hits of Istanbul in one day, but for anyone who has more time to spend, it’s a must. The Church of the Holy Saviour in Chora was originally built in the 400s and was expanded in the 1000s of Constantinople. Most of what survives today—including the incredible mosaics covering the interior—were finished between 1315 and 1321. Alas, the city fell to the Ottomans in the mid-1400s and around 50 years later the building was converted to a mosque. 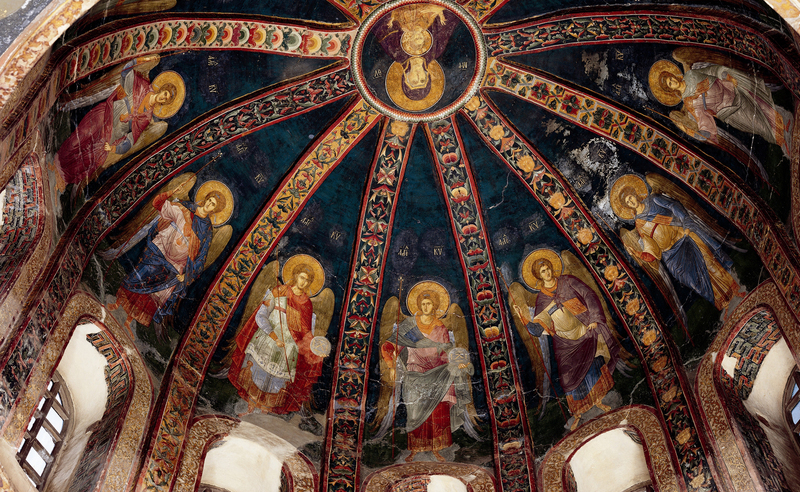 As with Hagia Sofia, the conversion process meant covering up all the icons with plaster, which in the long run was a much better outcome than just defacing them, as happened in so many other churches in lands that fell to Muslim invaders. The action ended up preserving the mosaics and paintings, which were restored in the mid-1900s, after Turkey became a republic. In 1958, Kariye opened to the public as a museum. The church itself is an asymmetrical oddity built on a slope, rebuilt and added onto several times. The mosaics though, restored to their former glory, are a stunning site. They are grouped into three large rooms, some illuminated by domes overhead, while doorways between them have some of the most impressive works over the top. While the beauty of the artwork is arresting on its own, the explanation of a guide or good book can shed some light on what you’re seeing. Jesus and Mary take center stage, of course, but in a different light than usual. The pre-Jesus lives of Mary and Joseph get more action here than in most churches, including one panel where he returns from a business trip and finds Mary pregnant. Plus we see Jesus in that seldom-covered stage between being a baby and being an adult. Then there are the saints important and minor, righteous kings, church benefactors, and angels. Although the artists are uncredited and unknown, their work is of a high quality and the colors are still vivid. Creating mosaics is patient work done by masters over long periods, while the paintings were done while the plaster was still wet, causing them to fade less over time.